The initial idea was to used stacked slabs to form an enclosure for an Arduino with one shield attached to it. Each slab is made from wood, giving a warm natural feel to the piece. Recessed LED lighting (within the gaps) can be used for an output interface for applications like a Pomodoro timer. Ideas for an input interface include: switches, optical proximity sensing, and capacitive touch sensing. Connecting bolts (1/4-20 in various lengths), used in Ready-To-Assemble furniture, provide a nice looking visible fastener. The longest commonly available size is 70mm (-2.75″), which uses a matching cap nut. The hex heads on both the bolt and nut, along with the wide and flat head, give the appearance of a rugged, strong fastener. These bolts also make it easy to open up the enclosure when working on the internal electronics. 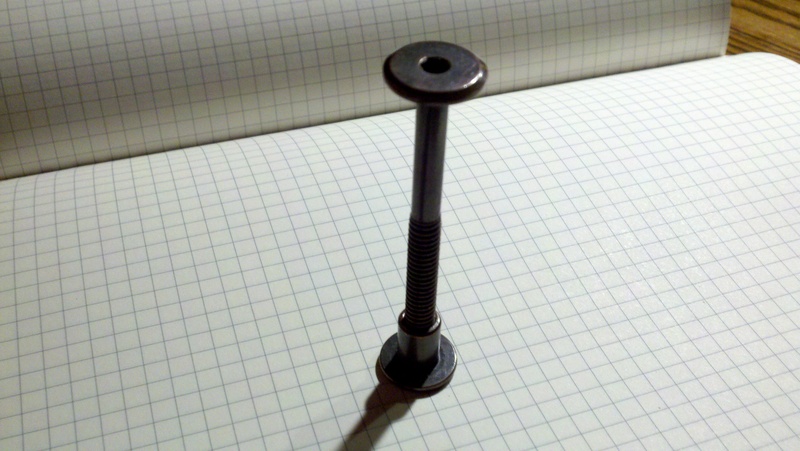 Selecting this bolt to hold the stack of slabs together set the design height to 2.75″. Notice that 3U + 8U = 2.75″. This suggests using 5U + 13U = 4.50″ as the width. Note that 4.50 / 2.75 approximates the Golden ratio. An interesting property of Fibonacci sequences is that a new sequence created by summing members creates a new sequence where the ratio of adjacent members also approximates the Golden ratio! 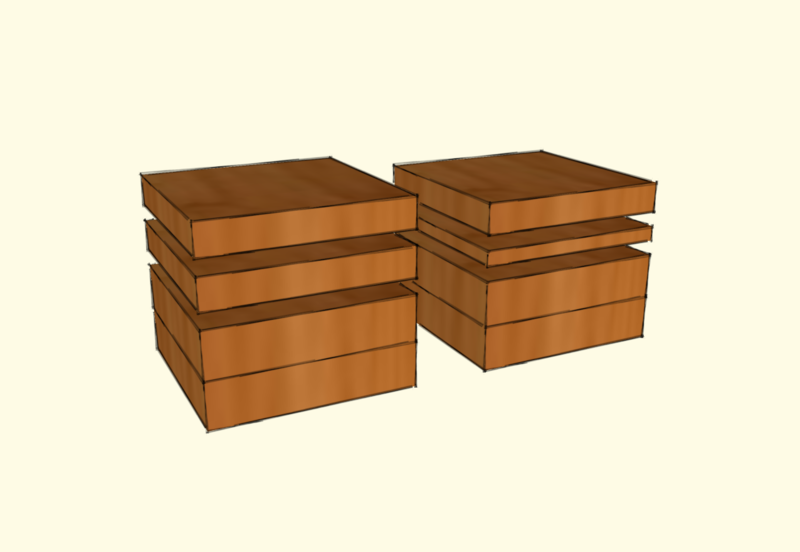 Since the slabs are square, this gives an overall size of 4.50″ x 4.50″ x 2.75″. Using the original sequence, notice that 1U, 2U, and 3U are common material thicknesses (a consequence of starting with 1U = 0.25″). Given an 11U height constraint and slab thickness choices of 1U/ 2U/ 3U, a finite number of choices exist. Since enough room is required in the base to fit an Arduino and one shield, this requires at least 2 x 3U. This leaves 5U for the remaining pieces. A nice balance is 3U cap and 2U spacer. 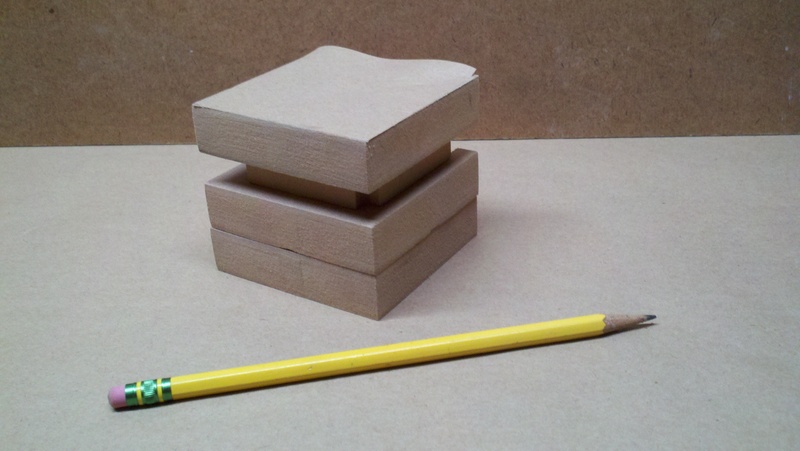 A quick test was done with some MDF blocks from the scrap bin (wrong widths), as seen in the picture. The configuration is reminiscent of buildings like Falling Water. Here is a sketch with the correct dimensions. 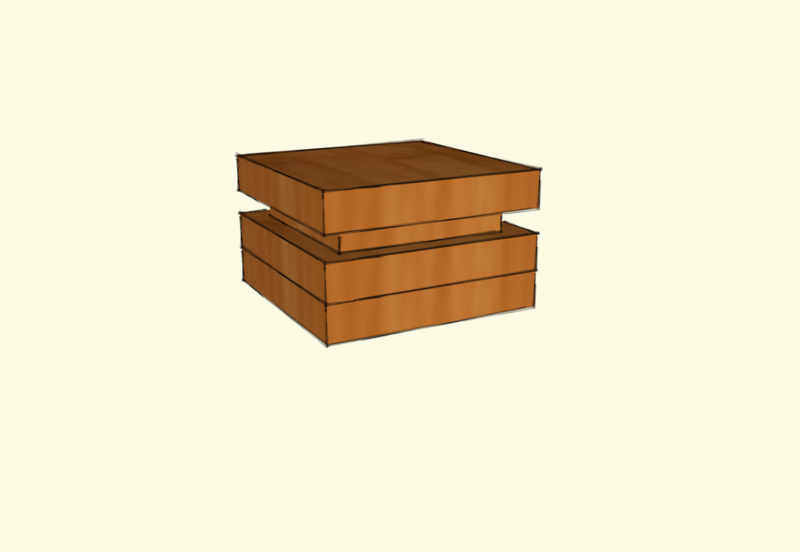 This was selected as the overall form for the enclosure.